AN EASY and LEVEL-ish walk around the hill top through trees and views. Most, except cobbles and steep parts (in italics) which can be avoided, is suitable for pushchairs and wheelchairs. Much of the walk is away from cars and you will meet dog walkers. You could easily walk it in 30 minutes. 1 START AT THE GUILD HALL at the bend in the High Street. 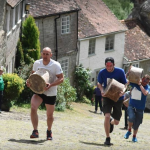 2 Taking care on the cobbles, you can go around the Guild Hall to gaze down Gold Hill, the view framed by receding cottages and the high, buttressed greensand wall. 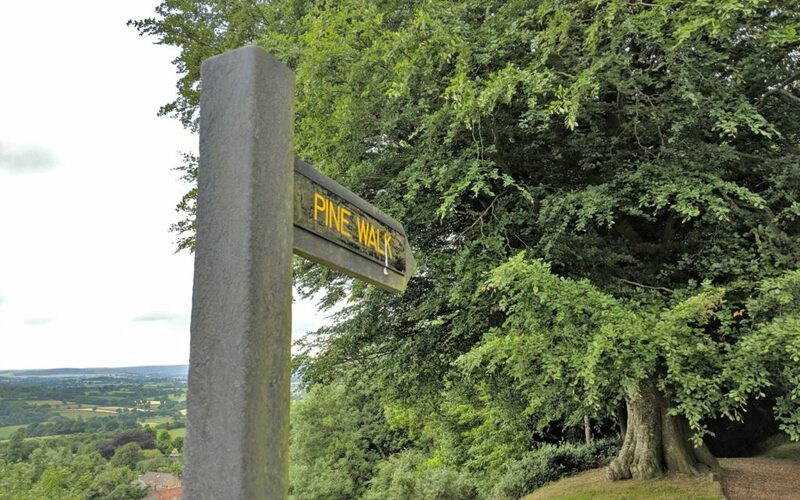 Then go along Park Lane, or direct from the High Street west into PARK WALK, a broad promenade with wide views over the Blackmore Vale to the south and Melbury Hill to the south-east. Nuns walked here from the 9th to the 16th century, around the Abbey founded by King Alfred for his daughter Aethelgifu. The under-town (sub-urb) of St James lies beneath the slopes. Hardy’s ‘Vale of the Little Dairies’ was deprived of manifold hedgerow elms by the 1970s spread of Dutch Elm Disease. Oak, ash, hawthorn, alder and field maple now predominate in the hedgerows and woodland: beech, yew, hazel, field maple and ash thrive on the chalk hills. 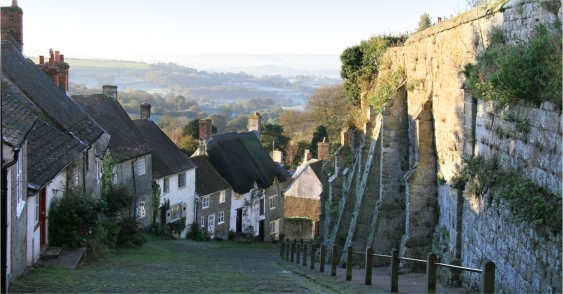 (Further reading: Take the Thomas Hardy route around Shaftesbury and North Dorset). Park Walk was donated to the town in 1753 by Robert Dyneley, the Lord of the Manor, who planted a row of newly fashionable sycamore trees to provide a shaded walk. They proved a good choice of species, standing up to the prevailing south-westerlies for two centuries before a violent ice storm damaged them so badly that most had to be felled in the 1950s. 3 A handful of early sycamores remain; miscellaneous later plantings are gradually being replaced to recreate the shaded promenade. Sycamores do well here and their depiction in the mayor’s chain of office is a measure of their historical significance to Shaftesbury. Well below the eastern end of Park Walk, a small wild fruit wood has been laid – for the beauty of blossom, for pollinating insects as well as for fruit – amid the numerous wild cherry trees. 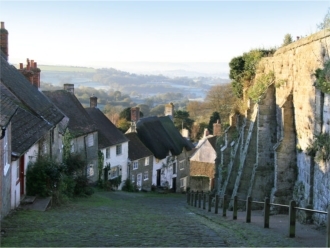 Shaftesbury is one of the earliest bee-friendly towns in the country. Continuing along Park Walk, beyond the Abbey Ruins and Museum, the Westminster Memorial Hospital and the old sycamores, you reach a huge beech tree. 4 Commanding in summer or winter garb, the beech stands where Stoney Path diverges to descend to St James. 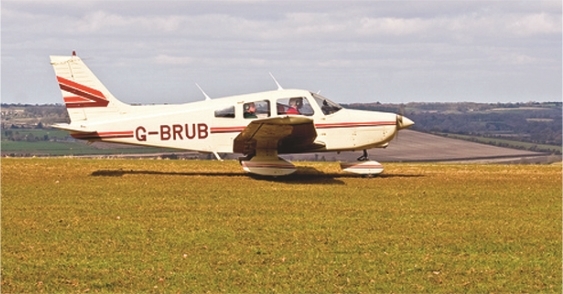 In Jude the Obscure – a large part of which is set in Shaston, an old name for Shaftesbury – Thomas Hardy described two large lost beech trees nearby as having ‘smooth, mouse-coloured trunks’ but this one is rough and fissured until the branches are reached. Unusual in these parts, two sweet chestnuts 5, one with spiralling bark, stand in solidarity on the bank just above Stoney Path. Where the formal walk ends, the upper, narrow gravel path of Pine Walk runs through the tall branchless boles of statuesque beeches that catch the winter light and cast long shadows over the path. As part of a fashion for all things Scottish, PINE WALK 6 was extended in Victorian times. Scots pines predominate at the western end and the smell of resin on a hot summer day is reminiscent of warmer climes. Ravens have started nesting here. Listen for their gravelly voices as they fly, and for the greater spotted woodpeckers rattling out their morse messages on the trunks. Pine Walk meets one of the ancient hollow ways into the burgh, a narrow busy corner – St John’s Hill. Taking great care, make the hard turn right into LOVE LANE: on a rise, it runs parallel with the tops of the trees in Pine Walk. 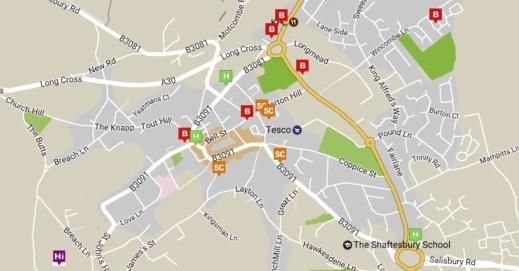 Then take the first left up LANGFORDS LANE to the junction with BIMPORT. Here you turn right beside a fine white-flowered cherry tree 8 in a front garden. As you reach MAGDALENE LANE, cross over Bimport to the north and down an unmade lane that leads to Shaftesbury’s unofficial Town Green. Walk westwards across CASTLE GREEN, the location of beacon ceremonies, dog walking and picnicking: it is part of the Scheduled Ancient Monument of the Saxon burgh. On a clear day, you can see as far as Glastonbury Tor and King Alfred’s Tower. Take a more difficult route: turn left and head to the south-west corner into Bimport and, being very, very aware of traffic turn right a little way down St John’s Hill and onto a path on the right to see The Shaston Yew 7. This multi-stemmed tree is declared to be of national significance by The Ancient Yew Group, not least because of its spreading branches arching into the ground, some rooting – a trick of the trees – showing there is more than one way to build a forest. 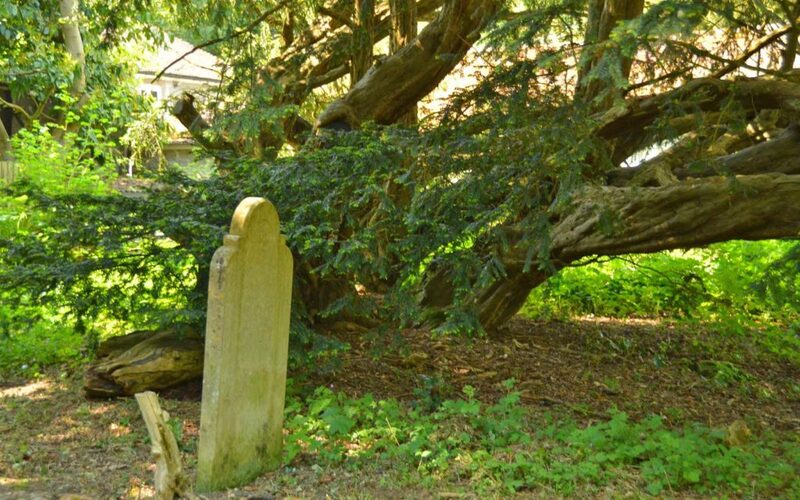 Yews can last for thousands of years. The Bury Litton is the old disused churchyard of St John. From here, return to Castle Green. Staying on top, walk back by the railings taking in the views to the downs. At the north-east corner is the Queen Mother’s Garden 10, full of flower for all types of bees. Trace your steps back to BIMPORT and cross into ABBEY WALK. Just before the Austrian Pine 11 by Westminster Hospital, turn left, to walk through Trinity Churchyard. 12 Lime Avenues were fashionable in the 16th and 17th centuries, and the Common or European Lime was often chosen because of its capacity to withstand repeated cutting. These avenues could be 250 years old, important living monuments and worthy of great care. There is evidence that some of the side branches were pleached – woven together to form an interlocking screen. Care is now going into their wellbeing, management and replanting. The taller pollarded limes along Bimport are younger – post 1850. A spreading English yew grows to the north of the church. Many snowdrops have been planted in recent years and are celebrated in mid-February around the town. Holy Trinity Church, designed by a young George Gilbert Scott in 1838-1842, replaced a charming church with a distinctive bell gable. The deconsecrated church is now largely used for community activities. Leave the south-east side of the churchyard into LYONS WALK, down to turn right into the HIGH STREET and back to the GUILD HALL. 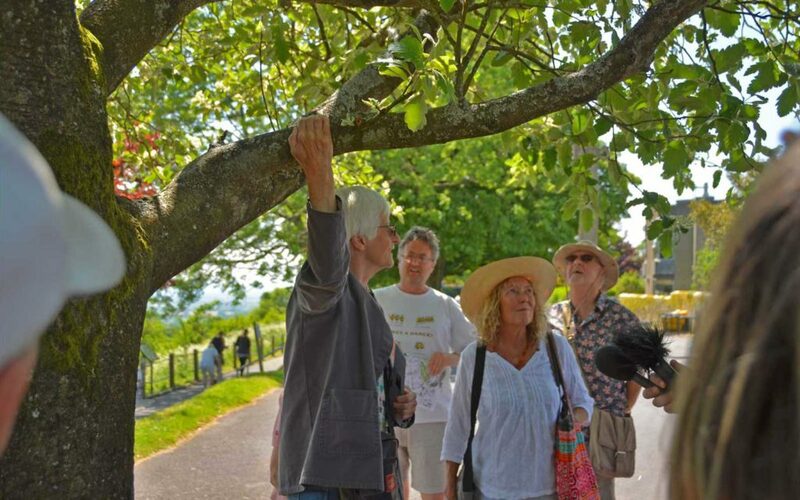 The words and concept are those of Shaftesbury Tree Group. The map is the work of Gary Cook of West Melbury. 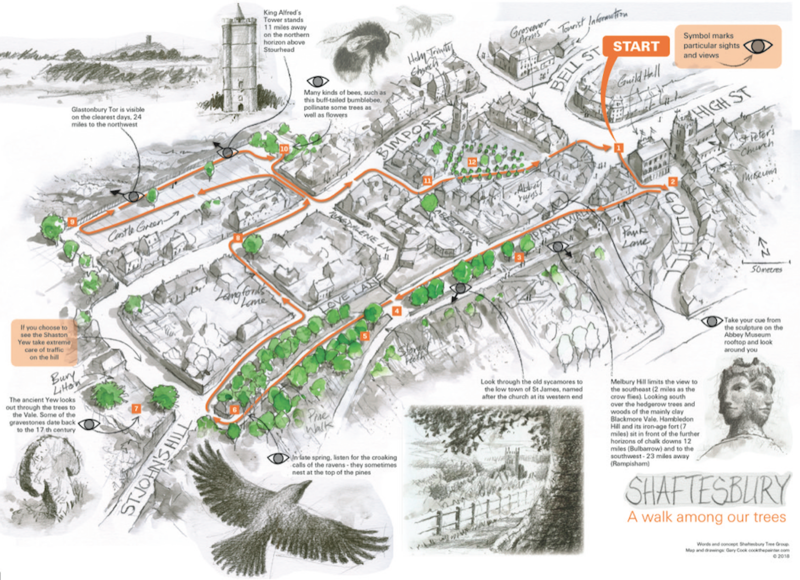 A printed copy of the map and words is available from Shaftesbury Tourist Information Office (top, centre of the map).